Stenosis is the medical term doctors use to describe abnormal narrowing, such as can occur in a blood vessel or other tube-like structure. 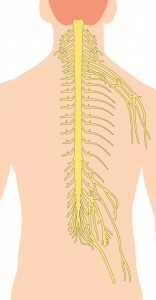 In the spine, there are primarily two tube-like structures. Neuroforamen: naturally created pathways at the left and right sides between two vertebrae. Spinal canal: it contains the spinal cord, which becomes the cauda equina in the low back. The cauda equina is a bunch of individual nerve fibers that resemble the tail of a horse. The vertebral bones (bodies, arches, pedicles) create this natural vertical hollow to hold and protect the spinal cord and cauda equina. Foraminal stenosis occurs when something compresses a nerve exiting the spinal column through the neuroforamen. Central canal stenosis occurs when something compresses nerves in the spinal canal. Some people develop both types of cervical and/or lumbar spinal stenosis. Some patients have a history of back injury or trauma. The accident may have happened months or years before the onset of stenotic symptoms. Some people have no symptoms; they are asymptomatic. However, spinal stenosis usually is progressive, which means symptoms gradually develop and may worsen. Pain and symptoms may spread into another part of the body. This is called radicular pain or radiculopathy. Consult an expert about your neck or back pain, pre-existing spinal stenosis or changing spinal disorder. An accurate diagnosis is essential to an effective and successful treatment plan. Diagnostic testing may include x-rays, CT or MRI scans, or myelography to enhance the surgeon’s examination of your spine. Instrumentation and fusion stabilize the spine and may be combined with another procedure. Instrumentation utilizes implants such as interbody devices, screws, rods, or plates. 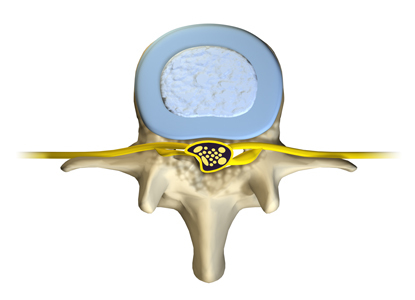 Bone graft is packed around the instrumentation to help the spine heal and fuse two or more vertebrae together. We hope this information about spinal stenosis has answered your immediate questions. Remember, your doctor is your most valuable source to answer your questions about symptoms and your healthcare.